In the 21st century there are just some things it is hard to do unless you have a credit card. Booking a hotel room now often requires you secure your reservation with a credit card. Some establishments will accept a debit card instead but they will often place a sizable hold on funds in order to do so. The same holds true for many car rental companies. Having a credit card and using it responsibly is also one of the best ways to build up a good credit rating as well, something that everyone should aspire to do. However if you really do not make that much at the moment is it possible to get a credit card at all? Your credit score is a large part of a lending institutions decision making process when it comes to credit cards but increasingly income level is also very important. It always has been but the changes made after the Credit Card Act of 2009 made it even more important. That act states that lenders must ensure that on paper at least a person has the means to repay their credit cards debts, in other words that they have sufficient income, taking into account other debts like a mortgage, car payments etc. Having a lower income will not necessarily prevent you from getting a credit card if your credit score is good enough but it will affect your credit limit. The lower the income, the lower the credit limit is a general rule of thumb. However if you are a young single person who lives with their parents, has no mortgage and no other real debts you are likely to get a higher credit limit that those who have a house payment and/or car payment to make. A lower income may only qualify you for basic credit card offerings though. A person earning minimum wage is not really going to be eligible for the more exclusive cards even if they have a credit rating of 800! No bank or lending institution will ever reveal their exact lending criteria directly but there are general patterns to each credit card that become apparent over time and cards can be grouped into basic categories, including credit cards that are suited to those with a lower income level. When you are researching various credit cards it is of course very important that you know just what your current credit score is. Having a lower income than others does not necessarily mean that you will have a worse credit score and many credit card lenders do recognize that. But because you do have a lower income you should look for credit cards that have a small or no annual fee to worry about and if you do not think you will be paying them off every month a credit card with a low monthly Apr. Rewards and cash back are nice perks to get and there are some cards that offer these kinds of things that you may be able to qualify for but they should not really be the determining factor when choosing between the various credit card offerings. And only apply for one or two credit cards. Every time anyone applies for a credit card it impacts their credit score in a slightly negative way so you do need to be cautious. If you have been turned down for the credit card you did apply for you should make sure you find out why. Most lenders will send out a denial letter offering to let you see a report detailing the reasons for denial if you contact them. Many people at that point simply do not bother to do that which is an unfortunate mistake. If it does nothing else you will know what problems in your financial life need to be addressed. If you still want to have a credit card in your wallet, especially if you are trying to build or rebuild your credit profile, you could consider a sub prime credit card like those offered by HSBC via Orchard Bank. Sub prime credit cards are offered to those with limited credit histories, not so great credit scores and yes, lower incomes. 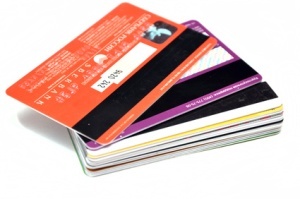 These cards are offered by some major banks, like HSBC, and also by some smaller lenders who specialize in issuing these kinds of credit cards. In the past some sub-prime credit card companies have come in for major criticism because of the high fees they charge as well as some fairly predatory lending practices. Many of the cards that were most heavily criticized are no longer offered though and although offering like the Orchard Bank credit cards do indeed have higher interest rates and some annual membership and application fees attached to them but they are reasonable and these sub prime credit cards do over a limited credit line to those with lower incomes without having to save money for a security deposit. A secured credit card is another option open to those with a lower income. Many of these cards however do require you deposit at least $200 as security, which may be hard for some on a lower income to find. You do not lose the money however as most secured credit card issuers place your security deposit in an interest bearing savings account and provided you keep your credit card account in good standing should you decide to close it you will get the money, plus any interest earned, returned to you.